I belong to a message board where I chat with others who share my love (obsession?) of cooking, baking, and all things food. In fact, lots of those ladies also like to make food, photograph it, and write about it on the internet. For a long time now, many of them have participated in recipe swaps. I’ve really wanted to join in the fun, but with moving, living in a hotel, and traveling, I didn’t think it would be fair to commit to participating and then not being able to hold up my end of the deal. Now that we (finally!) are starting to settle in and things feel normal (well, as normal as they can feel when you live in a country and culture very different from your own!) I can finally play along! Each recipe swap has a different theme, and usually the blogger submits a specific recipe that fits within the theme. This time, however, it’s Blogger’s Choice style! So we each are assigned a blog and get to choose any recipe. I was assigned Kate’s Recipe Box. I am not super familiar with Kate’s blog, so I spent a good amount of time going through the archives and bookmarking things. In the end, I kept going back to this casserole. Something about it was just calling my name. Jesse and I were both really happy with my decision. Later in the evening I overheard him talking to his dad on Skype and telling him about the delicious “Mexicanish” dinner I made. Then he said something about chicken which really made me laugh, there is definitely no chicken in this meal. Haha. I made only a few minor changes to the recipe, using my own Enchilada sauce recipe, and a couple small adjustments to ingredient amounts. I also made Mexicorn (recipe to come) as a side dish and wouldn’t you know, we both just mixed it right in to the casserole. Next time I might consider adding corn right to the dish. All in all, a big win for us! Preheat oven to 350 degrees. Prepare pasta to al dente, according to directions on box, drain and set aside. In a large skillet, heat the olive oil over medium-high heat. Add the red onion, jalapeno, bell peppers, and garlic, saute for 6-7 minutes., or until vegetables start to become tender. 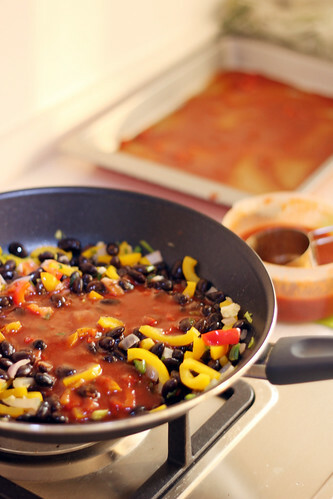 Stir in seasonings, black beans, and 1 cup of enchilada sauce, cook for another 5 minutes. Add the pasta, 1/2 cup of cheese, green onion, and cilantro. 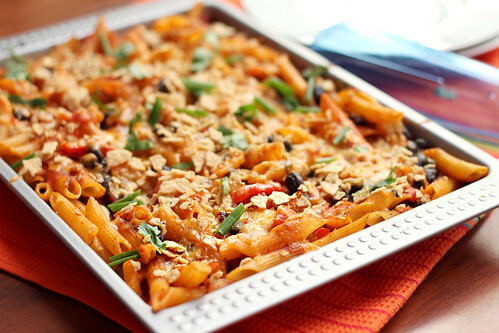 Stir until the cheese has melted and the pasta is evenly coated with sauce. In the bottom of a 9×13 baking dish, spread 1/2 cup of Enchilada sauce. Pour the pasta into the dish, using a spoon to evenly distribute in pan. 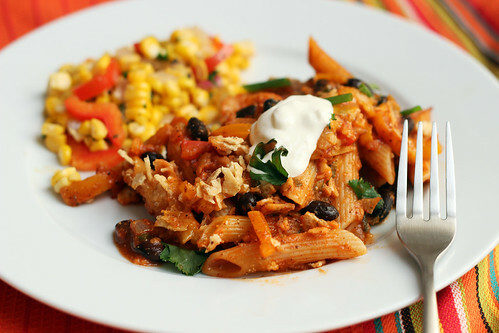 Pour the remaining 1/2 cup of Enchilada sauce over the pasta, top with remaining 1/2 cup of cheese. 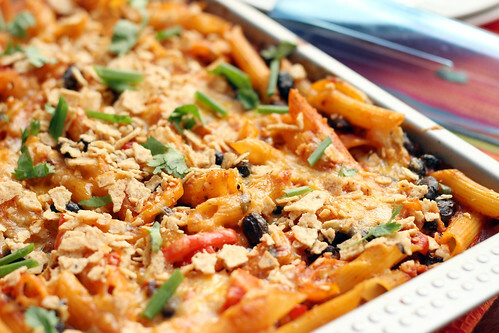 Bake for about 15 minutes, or until the cheese on top is melted and bubbly. Sprinkle with crushed tortilla chips, green onions, and cilantro. Serve with sour cream, salsa, and/or avocado. In a small sauce pan heat the vegetable oil and cook the bell pepper until tender. Add the rest of the sauce ingredients from tomato sauce to salt and pepper. Bring to a simmer and cook for 5 minutes. *I made this sauce the day before I needed (and stored in the fridge until I was ready to use it) making the pasta that much easier to throw together. Bonus, the added day in the fridge gave the flavors lots of time to meld together and enhance. >Welcome to the recipe swaps! Glad you enjoyed this – you photographed it a lot better than I did! >Oh we would love this! >I'm so glad you're settled and participating in the swaps…I love, love, love swap Friday's! 🙂 And getting your blog was obviously a pleasure! I am adding this to my list to make. I love that Jesse thought there was chicken in it! >I've been eyeing an enchilada casserole for awhile but haven't made one. Yours looks beautiful, may be time to bump it into the cooking rotation. >Thanks, Kate! We really loved this meal and I have several more bookmarked to try! >Isn't he hilarious?! I can't wait to participate in more swaps! Loved your potato photos! >I bet I could sneak this one by my family – regardless that there is no meat involved. Looks really good. >I've been looking for some new vegetarian recipes and this one looks great! Plus, I have a slight obsession with Mexican food. I'm definitely going to have to try it. >This sounds fabulous! I might just make this for a new mom this week! And, I can't wait to see that Mexicorn! hahaha!! !